The below post contains affiliate links. See bottom for full disclosure. 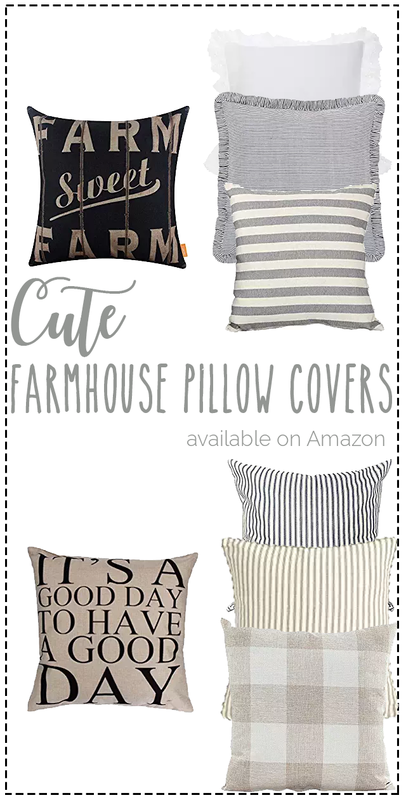 You all know how much I love pillows, farmhouse style, and well...Amazon :) They luckily go together really well! I'm a crazy pillow hoarder, seriously. Ask my husband. So, to curb my addiction and help save space in my house, I try to buy covers only and not pillows themselves. Sometimes this works, and sometimes it doesn't. When you see a pillow you really love that comes with an insert, how can you resist? :) Well, I'm sure I could, but usually don't want to. I figure I can just try to stuff more of my other pillows into my already bulging closet. Anyway, I'm on a kick again and wanted to share with you some of my favorite pillow covers I've found on Amazon lately. I have a few of these, which I'll note. And the ones I have, I love! I tried to do only Prime items, but a few of these aren't so watch for that. Also, be sure to do your own due diligence before buying...making sure you're okay with the reviews, pricing, etc. I can't account for the quality of many of these since I haven't bought them yet. But, when I do, I'll be sure to update this! Thank you. I love making pillow covers, but also buying them. I like the check ones. Will go and check them out.